There are a lot of different potting soil “recipes” out there, you just need to understand which ingredients are added and why to formulate the perfect mix for your purposes. Some bagged potting soils are not of the highest quality, containing unnecessary cheap fillers and less than the best ingredients. When you make your own potting mix you decide exactly what will go into it and which ingredients are most important to use the highest quality. You can also completely avoid chemicals. A lot of money can be saved by making your own potting mix too. Before the days of expensive bagged potting mix, gardeners made their own with whatever free organic materials were easily available. Good garden soil was simply mixed with well rotted manure, leaf mold, pine bark and wood ash. Some gardeners use soil from their garden for containers, and that may be fine for certain plants. But in general your soil will remain more moist and compact more easily and so will require more careful attention. Using garden soil as well as homemade compost in a potting mix is excellent, but may introduce weed seeds to your container, special care will need to be taken to ensure that the compost heated ups sufficiently to kill seeds as well as any disease, fungus or bacteria that may be present. And if you add manure to your compost you could be introducing too much nitrogen for a container which can burn your plants. All these issues are of more concern if you are using the mix for seedlings. Those tiny seedlings are very susceptible to fungus and bacteria and there is no food source for them other than your seedlings. If you use garden soil or compost for your mix, some gardeners will pasteurize it before use by heating it in the oven or give it a solar cooking for a few weeks covered with black plastic in the back yard. Do not heat it to an over 190 degrees or all new problems are created which may inhibit plant growth. To use homemade compost for container gardens with outside ready plants, pasteurizing is not necessary. High heat in the composting process is still important but you wont need to be as cautious. Garden Soil: will give your mix density to support plants. Ideally it should be heated or solarized first. 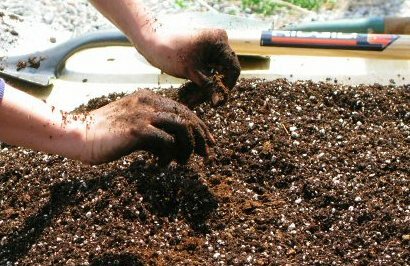 Homemade Compost: used to replace all or part of the peat, perlite or vermiculite with excellent moisture retention and nutrients. Compost can be 20 to 30 percent of your mix. 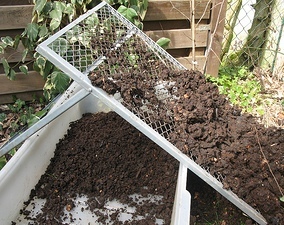 Compost needs to reach 160 to 180 degrees F in the composting process to be ideal for use in a potting mix. You may want to screen or sift out any larger pieces that may need to break down further, leaving you with fairly consistent particle sizes for your mix. Compost is full of nutrients, eliminating or reducing the need for many nutrients. Wait for your plants to “tell” you if they need more nutrition when using compost in your mix. Purchased Compost: If you do not have homemade compost available, purchased compost will do fine. And you won’t have to worry about heating it. Sand: make sure it is a coarse builder sand to improve drainage to your mix. A fine sand will fill up and clog air pockets that are important for roots. If you are using the right coarse grade, it will not look like sand as we usually picture it, it will look almost like tiny pebbles. Vermiculite: light particles that increase porosity and retain moisture. Use a medium for starting seeds, coarse for potting gardens. This volcanic mineral will also add calcium and magnesium, important for your plants. Vermilculite also has some capacity to hold and make minerals available to your plants. I also prefer vermiculite to sand, especially since it provides some insulation in cold regions. Can sometimes be a tad alkaline, which can balance the acidity of peat moss or pine bark if you use them. Sphagnum Peat Moss: adds lightweight bulk and holds water well. Peat breaks down very slowly. To balance the pH when using peat moss add a little lime. When peat gets dry, it is difficult to moisten, you may see water run right over the container edge or around the soil ball and out of the container. Water slowly until the entire soil mass moistens. Or avoid the problem by using compost instead. Coir Fiber: from coconut husk processing, it looks like sphagnum peat moss but breaks down even more slowly and will provide more nutrients for your plants. Pine Bark: should be composted first and will give your mix a light texture and helps air and water move freely through the mix. Nitrogen will likely need to be added as the pine bark will use nitrogen from the soil as it continues to break down. Pine bark is best used when planting perennials or shrubs in your containers. Worm Castings: has recently become easily available, or use vermicast. Castings are not only an excellent plant food source but will also retain moisture and hold loads of nutrients for your plants. Feather Meal: slow release nitrogen. Greensand: iron, magnesium and other trace elements. Limestone: commonly called calcium carbonate or dolomite limestone, this is used to help neutralize pH when acidic additives are used such as sphagnum peat moss or pine bark. You can also add slow release plant foods and soil conditioners depending on what you plan to grow. Remember that some perennials prefer little nutrition, some annuals prefer a lot. You may want to add plant foods or even some of the nutritional additives to individual containers as necessary. Keep in mind the needs of your plants. Succulents will need a lot of very coarse sand so the soil drains and dries very quickly. There are a variety of recipes for different needs, so once you figure out the basics, do some research for specialized needs like succulents, orchids, and any other special plants. On the next page you will find some basic potting soil recipes to get you started.